According to Barack Obama, “We tried this trickle-down fairy dust before. And guess what — it didn’t work then, it won’t work now. It’s not a plan to create jobs.” But only the most gullible members of the Democratic Party would find such words edifying. What really matters to the majority of Americans, a point all but ignored by the Obama-Biden Entourage, is the fact that since the beginning of the Great Recession, a total of 4,778,000 Nonfarm Jobs have been entirely wiped out, and what we have been waiting to hear is a coherent plan whereby they might be recovered, not the comedic rhetoric of a left-wing jester. 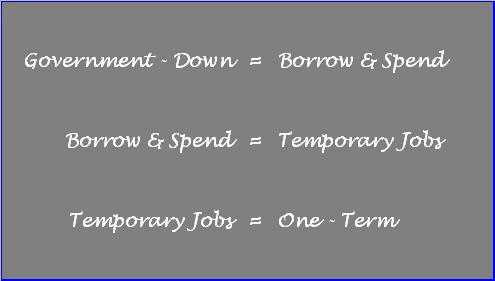 In reality what Mr. Obama’s words describe are his own government-down, borrow-and-spend, loot-and-plunder policies, which have not only failed to add a single net Nonfarm Job (see chart below), but have instead added more than $5 trillion to the National Debt in just four years, resulting in the first credit rating downgrade in U.S. history. Instead of inundating the nation with more empty rhetoric, what every American deserves to know is the truth regarding where we stand, and how furthering Mr. Obama’s government-down, borrow-and-spend policies would help to restore both America’s credit rating and American jobs. An analysis of real facts and figures, supplied by the U.S. Bureau of Labor Statistics, finds that during the Obama-Biden Administration a total of 316,000 Nonfarm Jobs have been lost, and regarding Private Sector Jobs, out of a mere 332,000 which have been recovered during the Obama-Biden Dynasty, every single one can be traced directly to the Temporary Help Services Industry. So when it comes to jobs, the pomposity we’ve all heard repeated over and over again by the Obama-Biden Crew and its cheerleading squad, including those prone to media-bias, is just that. A more substantive analysis begins. Examining the growth (decline) in Total Nonfarm Jobs [Private Sector + Government] since January 2001, it is clear that job creation is not something the Obama-Biden Administration should be bragging about. Here’s why (see chart below). From the end of January 2001 through the end of January 2008, a total of 5,557,000 Nonfarm Jobs were gained, during the Bush Administration. During the last year of the Bush Administration, as a result of the Great Recession, from the end of January 2008 to the end of January 2009, a total of 4,462,000 Nonfarm Jobs were lost. 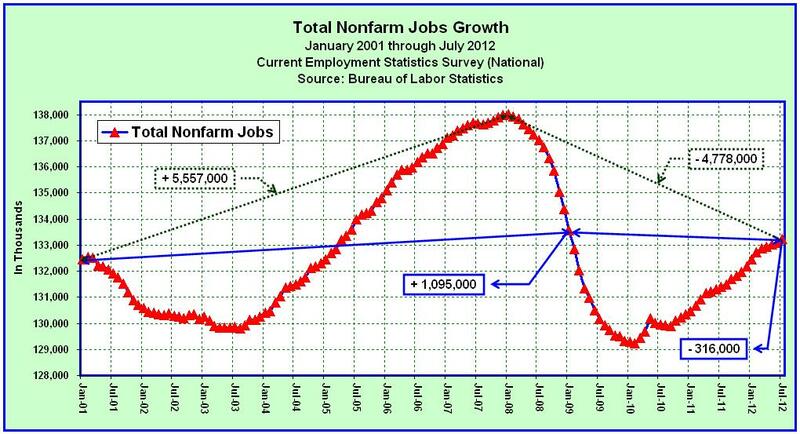 Thus, a total of 1,095,000 Nonfarm Jobs were gained during the Bush Administration. During the Obama Administration, from the end of January 2009 through July 2012, a total of 316,000 Nonfarm Jobs have been lost. Overall, we are still 4,778,000 Nonfarm Jobs in arrears, from a record high established by the Bush Administration at the end of January 2008. Thus, in terms of Total Nonfarm Jobs, 1,095,000 were added during the Bush Administration, a rather pathetic record since we need to create 1,524,000 jobs a year (127,000 per month) just to keep up with population growth. In comparison, after nearly four years, and $5.3 trillion in new federal debt, not a single Nonfarm job has been added by the Obama-Biden Administration, but rather 316,000 have been lost. In spite of the policies of Obama-Biden, Nonfarm Jobs are still 4,778,000 short of the January 2008 peak, so gullible Obama-Biden loyalists need to find something else to showboat. After cringing at the Total Nonfarm statistics above, gullible Obama-Biden loyalists will say that what they were really bragging about was their record on Private Sector Jobs (exclusive of Government). 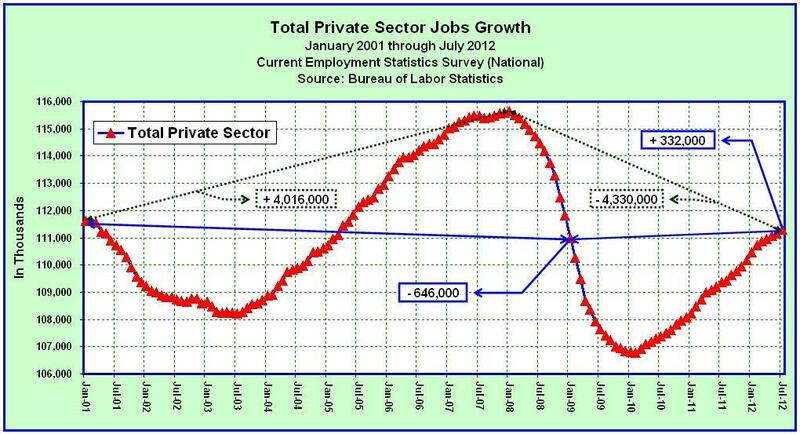 Okay, so let’s examine the growth (decline) of Private Sector Jobs since January of 2001. From the end of January 2001 through the end of January 2008, a total of 4,016,000 Private Sector Jobs were gained, during the Bush Administration. From the end of January 2008 to the end of January 2009, due to the Great Recession, a total of 4,662,000 Private Sector Jobs were lost, during the Bush Administration. Thus, a total of 646,000 Private Sector Jobs were lost, during the Bush Administration. During the Obama-Biden Administration, from the end of January 2009 through July 2012, a total of 332,000 Private Sector Jobs have been recovered. Overall, Private Sector Jobs are still in arrears by 4,330,000 from a record high established by the Bush Administration at the end of January 2008. So in terms of Private Sector Jobs, we have to hand it to Obama-Biden. While the Bush Administration lost 646,000 Private Sector Jobs over eight years, the Obama-Biden Administration has recovered 332,000 over the last four years. However, since we really need to create 1,524,000 jobs a year (127,000 per month) just to keep up with population growth, and since Private Sector Jobs remain 4,330,000 short of the January 2008 peak, the Obama-Biden Administration’s record isn’t really worth grandstanding. In fact, when government-down supporting, Obama-Biden loyalists discover the subsector in which these jobs were added, they should run as far away from their Party’s chosen platform as they can get. Which areas of the Private Sector gained jobs during the Obama-Biden Administration? To know the answer, one must comb through all of the various industries detailed by the Bureau of Labor Statistics, in Table B-1, sector by sector. Were jobs gained in Mining and Logging, Construction, or Manufacturing? No. What about in the Wholesale Trade, Retail Trade, or Transportation and Warehousing? Nope. How about Information, Financial Activities, Education and Health Services, Leisure and Hospitality, or Other Services? Nope. To be precise, the only sector of the economy where you’ll find any net jobs growth during the Obama-Biden Administration is under the Professional and Business Services category, and there only in the subsector named Temporary Help Services (under Professional and Business Services >> Administrative and Waste Services >> Administrative and Support Services >> Employment Services >> Temporary Help Services). Temporary Help Services (NAICS 56132) – The temporary help services industry comprises establishments primarily engaged in supplying workers to clients’ businesses for limited periods of time to supplement the working force of the client. The individuals provided are employees of the temporary help service establishment. However, these establishments do not provide direct supervision of their employees at the clients’ work sites. 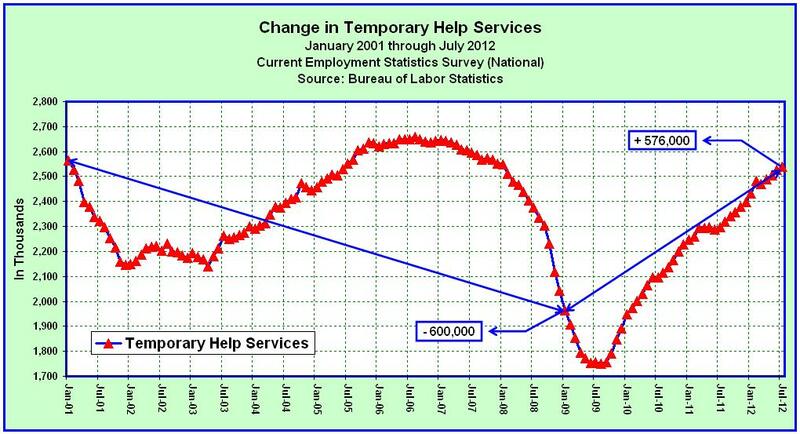 So let’s examine the growth (decline) of Temporary Help Service Jobs since January of 2001. So 600,000 Temporary Help Service jobs were lost during the Bush Administration, and the Obama-Biden Administration was able to recover 576,000 of them. In effect, since a total of 646,000 Private Sector Jobs were lost during the Bush Administration, among them, 600,000 or almost all were Temporary Help Service jobs. Since then, the Obama-Biden Administration has recovered a total of 332,000 Private Sector Jobs, and every single one of them, 576,000 minus losses in other sectors, were in Temporary Help Services. From the end of January 2001 to the end of January 2009, a total of 1,095,000 Nonfarm Jobs were gained during the Bush Administration. In contrast, during the Obama-Biden Administration, from the end of January 2009 through July 2012, a total of 316,000 Nonfarm Jobs have been lost. Meanwhile, as Barack Obama, Joe Biden and their gullible loyalists boast about this great accomplishment, we are still 4,778,000 Nonfarm Jobs, and 4,330,000 Private Sector Jobs short of the record highs established by the Bush Administration at the end of January 2008. Even worse, since the population continues to grow, from the start of the Great Recession the real jobs deficit in the U.S. has increased to 11,760,000. That’s the record. Those are the facts. That’s the truth. Like it or not, the only platform on the ballot this November which includes a plan and a promise to create more than 12,000,000 middle-class jobs over the next four years is the Romney-Ryan platform. In contrast, the plan and promise outlined by the Obama-Biden platform, to-date, includes more gloating, more lofty rhetoric, more special interest tax breaks, more deficit-financed subsidies, more uncertainty, more divisiveness, more government dependency, more government regulation, more borrowing and spending, higher health care costs, higher taxes, and with any luck a few more Temporary Help Service jobs. It’s time to wake-up. It’s time to care. It’s time to do what’s in your best interests and that of your country. It’s time to stop believing in myths, and time to ‘Believe in America’. ← Has Obama’s Loot-and-Plunder Theory Worked?